Our water quality and supply is being degraded by aquatic "bullies." MPR News host Chris Farrell recently spoke with Jeff Forester, executive director of the Minnesota Lakes and Rivers Advocates, Kelly Pennington, an aquatic invasive species prevention coordinator with the Minnesota Department of Natural Resources and Jim Wherley, co-owner of Sunset Bay Resort. Here are some key takeaways of their discussion, which took place at the third annual Aquatic Invaders Summit. Think of zebra mussels, for example, as "seniors on the kindergarten playground, just stomping around," Forester said. 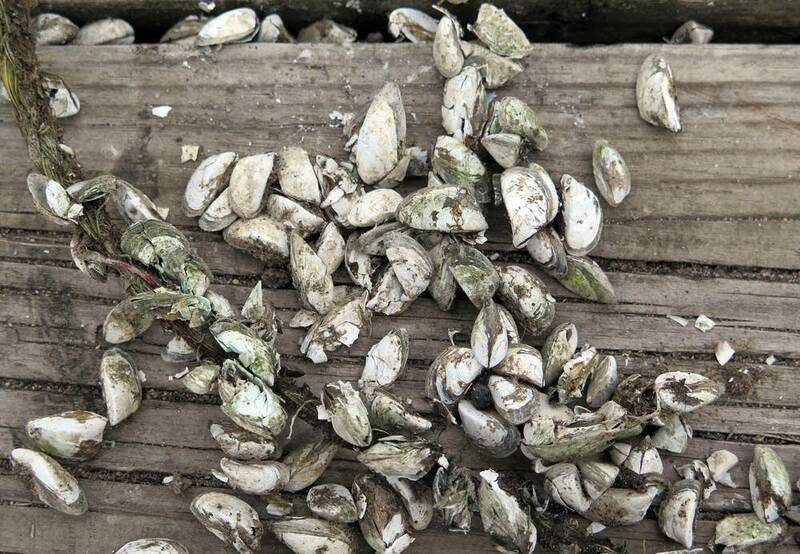 Zebra mussels gobble up plankton, making it unavailable to other aquatic life. They're "bioengineers," according to Forester. "They can come in and they can re engineer a system — a lake system — to suit them rather than what's been there before ... They can change the way these lakes systems operate often in ways that we don't like." And invasive plants like the Eurasian watermilfoil can also be pretty darn aggressive, forming thick mats underwater and at the water's surface, potentially interfering with boating, fishing and swimming, and even crowding out native water plants. "The invasive species are ones we think could have negative consequences for the environment, maybe for the way we use our natural resources, which could impact the economy here in Minnesota. Some of them could have impacts on human health," Pennington said. Ships carry ballast water in their tanks to remain stable when the vessel isn't loaded with cargo. "So they fill with ballast water where they take off, and they go across the ocean," Forester said. "And then they get to where they're loading up. And as they load up, they pump the ballast water out." That ballast water may contain invasive species. "Zebra mussels filter the water and the food for the fish. So a lot of our guests come to the area to fish. And without the fish in the lake, without that food being there for the fish in the lake, there could eventually not be that fish species for them to go out and fish for," said Wherley of Sunset Bay Resort. "That would negatively impact a resort owner by people going somewhere else — whether it's somewhere else in the state or out-of-state, which would take those tourism dollars away from Minnesota." "Clean, Drain, Dry" is one of the mantras of those who want to halt the spread of aquatic invasives. Boaters should clean their equipment, making sure no aquatic invaders might hitch a ride on it, drain live wells, and dry their equipment before transporting. Another smart practice is to dispose of unwanted bait, worms and fish parts in the trash. "Because there's not an unlimited supply of lakes," said Wherley. "There's only so many lakes in the world and there's only so much water supply in the world." Hear the whole conversation using the audio player above.